While travelling we all know the importance of taking pictures. We all want to click great pictures and take memories with us. Pictures are great way of showing other about the travelling you have done and if the pictures are not great it will spoil the moment. There are different pros and cons of taking DSLR with you while travelling. It is obvious that quality of pictures taken with a DSLR are top notch. With all the high-tech machinery DSLR will always be better in taking pictures when compared to smartphones and point and shoot camera. DSLR comes with high quality lenses which provide photo quality that cannot be compared with point and shoot camera and smartphones. DSLR’s zooming capability is far better than other cameras. With correct set of lenses, you can bring the object of which you are taking picture, very close to yourself. Zooming using other cameras is not so effective as their lenses are not capable of providing optical zoom. DSLR comes with loads of different settings. These settings can be played with and outcome of this is a great picture. DSLR can produce quality pictures that you cannot get with ordinary cameras and smartphones. Another advantage to taking DSLR is its ability to take image in RAW format. This format lets you to do edit the pictures in its early stage without losing quality. DSLR will let you capture moments while travelling, creating a great set of memories. 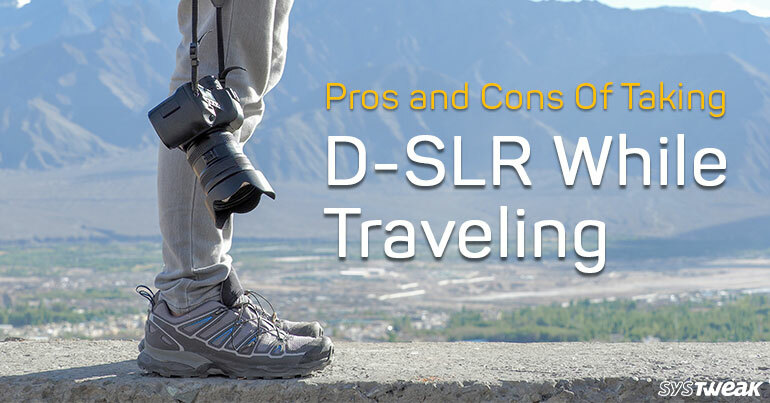 We have listed the pros of taking DSLR with you while travelling, now let’s look at cons. There are lots of things that you want to consider while taking DSLR with you. We have listed some cons that you should consider while taking DSLR with you. DSLR cost a fair bit of amount. You have to be very careful while you are travelling. Risk of losing the camera is very high. There is also a risk of Breaking the camera while travelling. DSLR are very delicate piece of equipment. If by chance you drop there is much possibility that some machinery inside it will break. DSLR are big in size and they take lots of space. If you are also carrying extra lens you have to carry its bag. You have to also pack cleaning kit with DSLR. DSLR have some weight to it, they do not fit into your pocket. To carry DSLR you have to hang it on your shoulder or around your neck, and after some time you can feel some stress while carrying it around. With advantage of taking quality pictures its disadvantage is that the size of the pictures clicked are huge. These pictures will take lots of space on your system and on the memory card also. Carrying DSLR will attract extra attention. And chances of theft will increase greatly. Most of the DSLRs are very expensive piece of equipment, and chances of getting it stolen are very high. Now you have seen all the pros and cons of taking DSLR with you. Not it’s up to you to take the decision of taking DSLR with you. Next Read: 10 RV Gadgets That Would Make Your Travels Better!